It�s funny how certain decorative throw pillows just become classics. It may be that Ikat pillows are loved because they work in modern or traditional decor. 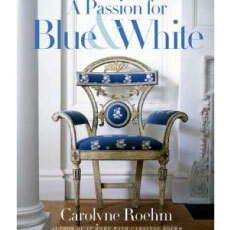 In her book, The Language of Interior Design, Alexa Hampton has a chapter called �Fabric Scheme.� She says that when she begins to design a room for a client she selects one fabric that is what she calls �the main.� It doesn�t have to be the one that is used the most in a room but it usually has some of the same colors in the other decorative accessories like the paintings or the carpet. It can be a print or a woven fabric an ikat or a suzani. She calls it the thesis statement. 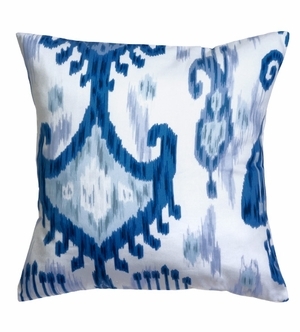 Whether you use them as a �thesis statement� or an accent statement, our ikat pillows are wonderful. 18� x 18� with flap back. Each Ikat pillow comes with a pillow insert. We sell all of the same ikat fabric that we use in our pillows, by the yard too. Exclusively ours.Click here to buy ikat fabric by the yard. See our suzani pillows too. I learned first hand that our ikat pillows work with many diverse color schemes when I repainted my living room. After painting, it was irresistable not to move my paintings around. Since there were fresh walls with no existing nail holes, I could come up with a new decorating scheme and not worry about messing up my walls. I wanted to hang new acquisitions of paintings and some old ones that were somehow languishing in the closet. After I moved the paintings this time, I decided I needed to put new throw pillows on the sofa. It made me look at the ikat pillows I sell in a whole new way. I selected the Blue & Brown fabric pillows. The colors in them go with the blues in the watercolors and oils I now have hanging in my living room and I am quite content. 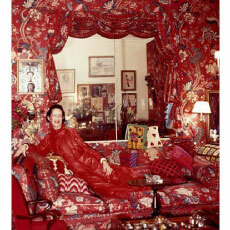 If you are in a Diana Vreeland like red mood, we have several ikat pillows that would work for you. One is red with beige. Another is red with violet. Vreeland famously told her decorator, Billy Baldwin, she wanted a "garden in hell" room decor theme which to her meant red. Every room needs a touch of red she said. Hers had more than a touch. 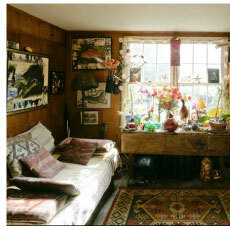 If you are feeling more like using Peter Beard as a muse, you may want to try our brown or cinnamon ikat pillows. I can see them in a room of brown leathers, and white ivory. Mix in an animal print rug and some interesting worry beads and shells and you have a decorating theme to keep you busy collecting for years. The room to the right is one of Beard's rooms in his Long Island home. I am sure he had plenty of safari photos around too. 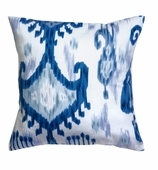 If you are a purist and love your blue and white without any other colors mixed in a la Carolyn Roehm, try our blue & white ikat pillows. We�ve supplied the variety. Now all you have to do is pick your favorite pattern. We carry ready made ikat pillows in all the decorative fabric we sell by the yard.